Guru.com is a freelance platform where independent professionals collaborate with employers from all over the world. This marketplace is a pool of freelancer with their own fields of expertise. Guru.com hosts individuals and groups who offer services in more than eight categories. This allows employers to carefully select the freelancer or guru who has the right set of skills that match their specific requirements. Additionally, Guru.com is an easy-to-use service. 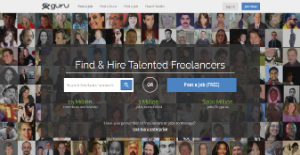 Businesses can search for freelancers or post a job and receive proposals straight from the homepage. With Guru.com, large businesses can even manage a big group of jobs or talents with the platform’s enterprise solution. This makes the hiring and managing of multiple gurus less arduous. On top of that, they even get personalized service from a Guru.com representative. Guru.com extracts minimal fees for processing payments on the website. Otherwise, there are no payments to be made by the job poster (unless they feature a job, a service that costs $29.95). This is a money-saver for business, as they also do not pay a price for posting their jobs and receiving proposals from gurus interested in taking their project. Employers are likely to have their preferred method of payment, which is why Guru.com supports transactions outside of credit cards and electronic payment gateways. The platform also accepts payments in the forms of checks, e-checks, wire transfers, and in-website cash funds. This makes paying hired freelancers more convenient for employers. Guru.com provides businesses a comprehensive dashboard wherein they can manage all aspects of their projects. From this area they can communicate with all their hired gurus, share project files, view a project’s progress, and track gurus’ times. This streamlines their workflow as the tools they require in managing projects are within easy reach. When an employer wants to reach more gurus on the platform, they only have to create a featured job. This service cost $29.95 and places the job on top of search results for 30 days. This increases the job’s exposure and is likely to attract more proposals from more gurus. The hiring process on Guru.com is a simple one. An employer chooses a freelancer they want to work with, sign a deal, and get the job started. This saves them time and enables them to close their project at a faster rate. At Guru.com, businesses are able to forge long-term relationships with gurus. They can offer preferred freelancers projects they know will be handled effectively, thereby they can rest assured of the quality of the results. This also makes them more productive as they do not need to spend a lot of time perusing freelancer profiles to find a person to do a job. If you are interested in Guru.com it might also be beneficial to investigate other subcategories of Best Freelance Platforms listed in our base of B2B software reviews. There are trendy and widely used solutions in each software category. But are they necessarily the best fit for your organization’s special needs? A market-leading software application may have thousands of users, but does it present what you need? For this reason, do not blindly invest in popular systems. Read at least a few Guru.com reviews and consider the aspects that you want in the software such as the cost, main features, available integrations etc. Then, choose a few solutions that fit your wants. Try out the free trials of these platforms, read online reviews, get explanations from the vendor, and do your investigation thoroughly. This in-depth research is certain to help you select the most excellent software application for your organization’s special requirements. How Much Does Guru.com Cost? Guru.com offers free job posting to employers. The payment processing fee is 2.5% for credit card transactions. For more information regarding the enterprise package, visit this page. We realize that when you make a decision to buy Freelance Platforms it’s important not only to see how experts evaluate it in their reviews, but also to find out if the real people and companies that buy it are actually satisfied with the product. That’s why we’ve created our behavior-based Customer Satisfaction Algorithm™ that gathers customer reviews, comments and Guru.com reviews across a wide range of social media sites. The data is then presented in an easy to digest form showing how many people had positive and negative experience with Guru.com. With that information at hand you should be equipped to make an informed buying decision that you won’t regret. What are Guru.com pricing details? What integrations are available for Guru.com? If you need more information about Guru.com or you simply have a question let us know what you need and we’ll forward your request directly to the vendor.